Junior First Aid is a practical course aimed at teaching first aid skills to children. It offers them a chance to practice first aid skills to develop their knowledge in life saving skills. This course is ideal to complete after our free online course for those who want to learn more in a classroom setting or as a stand alone course for those who have no skills. It is very important for children to also learn first aid skills and the course is taught in a relaxed and fun way to ensure that they learn and remember what to do in an emergency. I have a valid clean DBS certificate that I can provide to any concerned parent/guardian and I will be accompanied by another adult at all times on this course. Parents/guardians are welcome to stay and watch…or even better learn alongside your children by doing the Parent First Aid Course; I can run both these courses simultaneously. 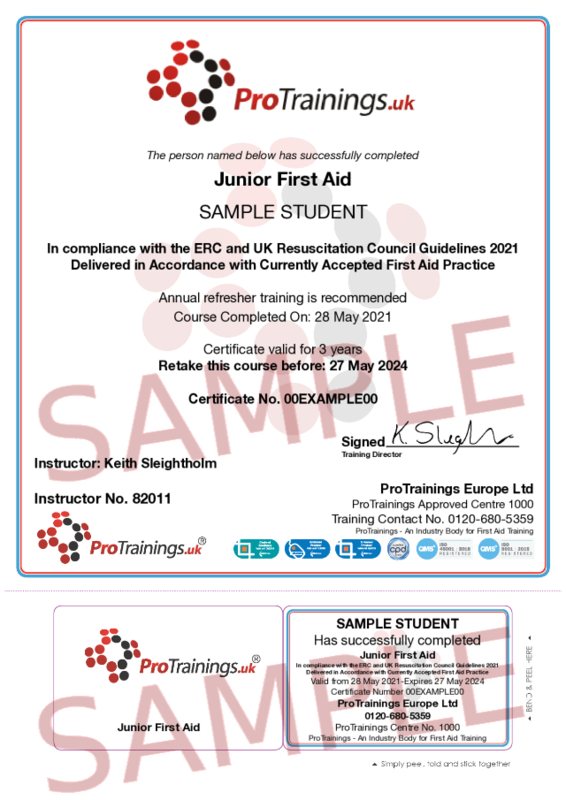 At the end of the course, all students will receive an official ProTrainings wall certificate and wallet card in the post as well as login area.